ventricular septal defect a congenital heart defect in which the opening in the ventricular septum (normal in the fetus) persists after birth, in either the muscular or fibrous portion, most often due to failure of the bulbar septum to completely close the interventricular foramen. This permits flow of blood directly from one ventricle to the other, resulting in bypassing of the pulmonary circulation and varying degrees of cyanosis. Defective valves affecting the flow of blood to and from the heart may also be present. 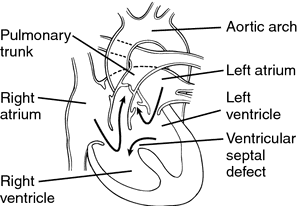 Abnormal communication between the ventricles in ventricular septal defect. From Dorland's, 2000. Relating to a ventricle, in any sense. Of or relating to a ventricle or ventriculus. adjective Referring to a ventricle of the brain or heart. a circulatory support device consisting of a pump with afferent and efferent conduits attached to the left ventricular apex and the ascending aorta, respectively, each conduit containing a porcine valve to ensure unidirectional blood flow; the pump rests on the external chest wall and is connected to an external pneumatic power source and control circuit. folds of mucosa, parallel and craniolateral to the vocal cords. Called also false vocal cords, vestibular folds. a cardiac anomaly rarely seen in animals in which both the aorta and pulmonary artery arise from the right ventricle and there is a defect in the ventricular septum. a rare syndrome of cardiomyopathy in cats caused by an excessive number of moderator bands in the left ventricle, extending from the papillary muscles to the ventricular septum. flow of blood from the ventricles is impaired by lesions or congenital abnormalities in the outflow tract. This is usually associated with hypertrophy of the ventricle and can be demonstrated with echocardiography or contract radiography. Left outflow obstruction occurs with stenosis and other anomalies of the aorta; right outflow obstruction occurs with pulmonic stenosis, pulmonic insufficiency, tetralogy of Fallot, and double-chambered right ventricle. due to focal weakness causes sudden death due to cardiac tamponade. a congenital heart defect in which there is persistent patency of the ventricular septum in either the muscular or fibrous portion most often due to failure of the bulbar septum to completely close the interventricular foramen. The defect permits flow of blood directly from one ventricle to the other, bypassing the pulmonary circulation and producing varying degrees of cyanosis because of oxygen deficiency. Its clinical characteristics also include a systolic murmur and a palpable thrill on both sides of the chest, dyspnea and poor exercise tolerance. The occurrence is sporadic except that it is inherited in goats and dogs. the muscular wall between the ventricles. A small section, between the aortic vestibule and the right atrium, is membranous. Failure of the septum to close completely during fetal growth causes a septal or subaortic defect. in echocardiography, the percentage change in diameter from diastole to systole. Calculated from the internal systolic and diastolic dimensions. It is a measure of mycocardial function. a method for examination of fixed heart by cutting it into 0.5 inch thick slices, perpendicular to the plane of the ventricular septum, from apex to base. Useful in examination of myocardial lesions and cardiomyopathy. is manifested by a high heart rate with or without arrhythmia. In both cases there is severe cardiac disease and often acute heart failure. There was global left ventricular hypokinesia with severe systolic dysfunction (Ejection Fraction 20%). Conclusion: There was a significant regression of right ventricular pressure following successful PTMC in mid-term (06 months) follow up of severe isolated mitral stenosis patients. Table-I: Left ventricular thrombus and gender of the patient. 2] There is also increased potential for progression into ventricular fibrillation or intraoperative asystole. 9) Several published reports suggest association of LVNC with poor left ventricular function, a high incidence of ventricular arrhythmias and systemic thromboembolism. Lot 3 Hire and/or purchase of equipment to support Short to Medium Term Ventricular Assist Devices. While confronting a patient in whom the DDD pacemaker interrogation shows nearly 100% ventricular sensing, but electrocardiographic monitoring shows ventricular pacing, the most important probabilities are: a) Dislodgement of the atrial lead into the ventricle and ventricular capture by it; b) Inappropriate connection of the leads to the generator (atrial lead being connected to the ventricular channel of the generator and vice versa). Pacemaker interrogation showing virtually no ventricular pacing in a ventricular pacing dependent patient: what is the explanation?/Ventrikul uyarisina bagimli bir hastada pacemaker sorgulamasi hemen hemen hic ventrikul uyarimi gostermiyor: aciklamasi nedir? The setting of additional switches (Sw 2 to 5), shown in the table in Figure 1, simulates two possible outcomes that follow an acute LVA: a decreased diastolic distensibility and scarring of the ventricular mass forming the LVA (in ventricle section S2) and a systolic dysfunction (a reduced contractiliy) of the prevoiusly unaffected portion of the left ventricle (in ventricle section S1). Left ventricular hypertrophy was defined by a left ventricular mass index, calculated by dividing left ventricular mass by height in meters to the power of 2. The aim of this study was to determine the incidence of early left ventricular infarct expansion within five days after first anterior ST-segment elevation myocardial infarction (STEMI) and the effect of early thrombolytic therapy on the incidence of early infarct expansion compared with late thrombolytic therapy. Right ventricular tachycardia is commonly due to ARVD/C or idiopathic right ventricular ventricular outflow tract (RVOT) ventricular tachycardia (VT) (25,26).